After months without a permanent leader, Wilkie will be tasked with ‘righting the ship’ and is set to focus on the Cerner EHR project, already underway. Robert Wilkie, a Department of Defense under secretary was confirmed as Department of Veterans of Affairs Secretary on Monday, giving the troubled agency a permanent leader for the first time since March. 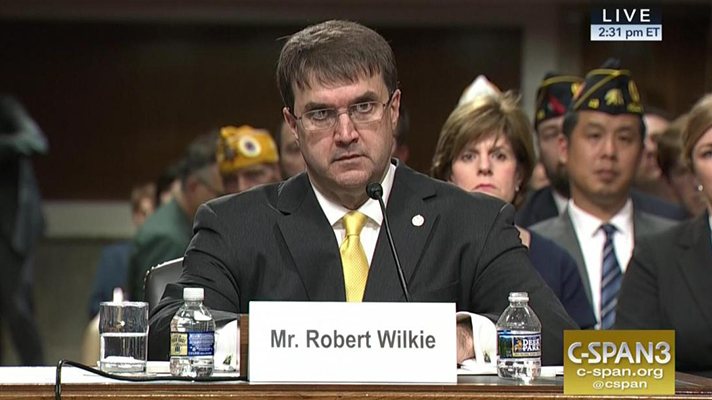 The vote of 86-9 makes Wilkie the first VA Secretary to not be unanimously confirmed. Nine Democrats and Bernie Sanders, I-Vermont, dissented. Sanders expressed concern that Wilkie would align with the Trump administration to privatize VA healthcare. President Donald Trump fired David Shulkin, MD. At the time, Shulkin was amidst contract negotiations with Cerner to replace the VA’s legacy EHR. Wilkie stepped in as acting secretary and signed the contract in May. After being nominated, Wilkie went back to the DoD to await his confirmation hearing. Peter O’Rourke has been overseeing the agency in the interim. Trump’s original nominee for the role, White House physician Ronny Jackson, MD, withdrew amid claims of workplace misconduct. Wilkie easily sailed through his Senate Veterans Affairs committee hearing, with only Sanders dissenting. And the hope, according to some of the senators at yesterday’s hearing, is that Wilkie will alleviate some of the turmoil at the agency. “We know the things that we've gone through with some of the previous appointees, and some of the problems at the VA now have a chance to be overridden and solved, and we'll step forward with a new day for the VA,” Sen. Johnny Isakson, R-Georgia, said. During his confirmation hearing, Wilkie said that prioritizing the EHR modernization project would be his top priority as secretary. “[The new EHR system] modernizes our appointment system, it is also the template to get us started on the road to automate disability claims and our payment claims, particularly to our providers in rural America and those who administer emergency care,” Wilkie said during the hearing. It’s been a year since Shulkin announced that the VA would overhaul its EHR and go with Cerner. In June, O’Rourke told Congress that the first install would be fully functional by 2020 and begin in the Pacific Northwest. Just last week, O’Rourke named the Office of the National Coordinator Deputy Genevieve Morris to lead the new Office of Electronic Health Record Modernization.